The main lodge accommodates 20 bunk-style beds in 4 rooms, and 2 director suites with a table & chairs. All of the beds have regular-sized inner-spring mattresses. There are updated men and women’s restrooms/showers on the same floor. Bedding is provided for the director/speakers staying in the suites. The Activity Center is a large 40’x60’ structure beautifully finished in knotty-pine that can seat up to 150 with a raised platform stage, 2 tv’s, dvd player and vcr are available. Bring your own sound/projection equipment. A locked kitchen in the back can be used as a canteen/snack shop. A separate Game Room has a pool table, ping pong table, 2 fooseball tables and carpet ball. The 15 cabins provide a clean, rustic lodging with a low counselor to camper ratio (8:1) which is ideal for small group ministry. The sturdy bunks are equipped with safety rails as well as comfortable waterproof foam mattresses. Four cabins have solid doors and glass windows and can be heated. The other cabins have screen doors and windows with shutters on the windows. The commercial kitchen is located in the lower level of the main lodge.There is a walk-in cooler, a commercial fridge, a chest freezer and a commercial stove/griddle. The kitchen is furnished with small appliances, pots, pans, dishes and utensils, dish clothes/towels and cleaning products. NOTE: There is no automatic dishwasher available. A restroom is available for kitchen staff. The Nurse’s Cabin has 2 small bedrooms, a sitting room and the convenience of a restroom with toilet and sink. A small fridge is available to store medications and ice packs and there is a locker for medications. 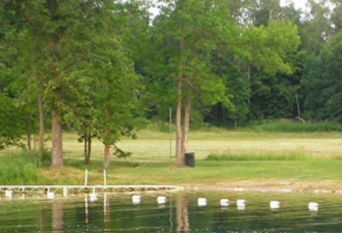 There are 7 RV sites which can accommodate up to 40′ RV’s. The sites have water, electric and sewer hook-ups. There are numerous tent sites available. The Waterfront provides many activities for the enjoyment of our guests with canoes, paddle boats, fishing boat and pontoon. There is also a roped swimming area as well as a diving raft. There are a set of standards for a game of water basketball if the group is not busy playing watermelon football. The highlight of the waterfront is the 150 foot waterslide, enjoyed by young and old alike. The shower house provides restrooms and hot showers for guests staying in cabins, tents and RV sites. Usage in the fall is dependent on weather conditions. A separate Laundry facility, supported by voluntary donations, is available to staff for kitchen towels and soiled bedding. 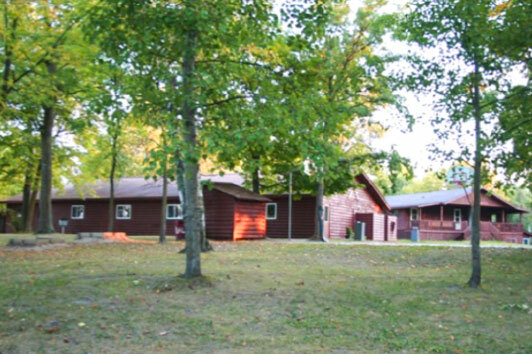 The dining facility is located in the lower level of the lodge and consists of two rooms. The cafeteria is right off the kitchen with booth seating for 40 people. A large dining room with seating for 100 people is connected to the cafeteria through a doorway and to the kitchen through a by-pass window. Seating is primarily tables and chairs with some booths. High chairs are available for the convenience of families with young children. The athletic field is a 10,000 square yard groomed field which is suitable for a vast array of outdoor sports and games. There are new softball backstops constructed on opposing corners. Standards are available for a game of 4-way volleyball. And the field is always great for a game of slip-n-slide soccer or Ultimate Frizbee! In addition, there are separate volleyball and basketball courts. The chapel is a screened gazebo with benches lining the inside perimeter. Extra chairs and tables can be brought in to facilitate the use for small group meetings.